Savour innovative dishes from Italian, Mediterranean, South-East Asian and Indian cuisine at the award winning Cilantro, the main restaurant at Trident, Gurgaon. Experience stylish fine dining under the crimson dome, or an al fresco experience on the outdoor verandah. Enjoy seasonal menus with fresh ingredients and themed nights, for a gourmet experience. Our chefs recommend you try their Buffalo mozzarella and tomato rucola pesto, asparagus with caramelised peach and boursin cheese, Mexican quesadillas, Italian parmigiana, Dover sole or balsamic braised pork belly. Or feast upon a lavish Mezze platter, authentic risotto, Thai red curry, the catch of the day – cooked as you like, Burmese khao suey, Japanese yakitori, Indonesian Nasi Goreng or a classic Indian curry. Cilantro was awarded Best European - Fine Dine, Gurgaon by The Times Food and Nightlife Awards, 2015. Cilantro restaurant is open from 6.30am to 1am. 6.30 a.m. to 1 a.m.
Prosciutto wrapped chicken - Fresh, tender chicken breast filled with duxelles and emmanthal, wrapped with Prosciutto. A delicious meal for any time of the day. 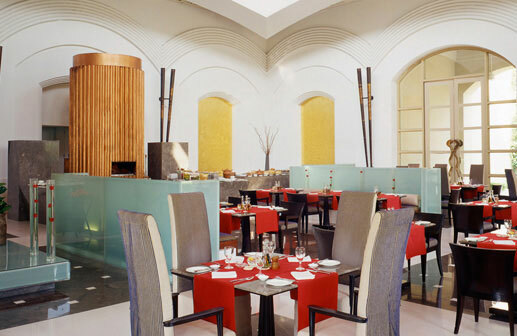 If Sundays are about lazy mornings and lavish brunches, then Cilantro is the perfect place for you. Cilantro for the very first-time unveils the Glenlivet evenings. Guests can enjoy premium single malt whisky paired with live music. Whats’more guests who order for a 15 year old Glenlivet will receive a 18 year old with our compliments. Similarly one can upgrade by buying a 12 year old and enjoying a 15 year old on us! The 12 year old has also been priced at an extraordinary value. Offer available from Monday to Thursday from 07:30 pm onwards.